The Republic of El Salvador is a country in Central America. Guatemala and Honduras are its northerly land neighbors, and the Pacific Ocean is to the south. El Salvador has a land area of about 13,000 square miles that includes volcanoes, mountain lakes, beautiful beaches and Mayan ruins. The country’s tropical climate accommodates a host of diverse flora. The flor de izote is the national flower of El Salvador. It grows on a tree commonly called bluestem yucca or yucca cane (Yucca guatemalensis). The tree is a fast-growing evergreen, multi-trunked with thick stems, usually reaching heights between 20 and 30 feet. 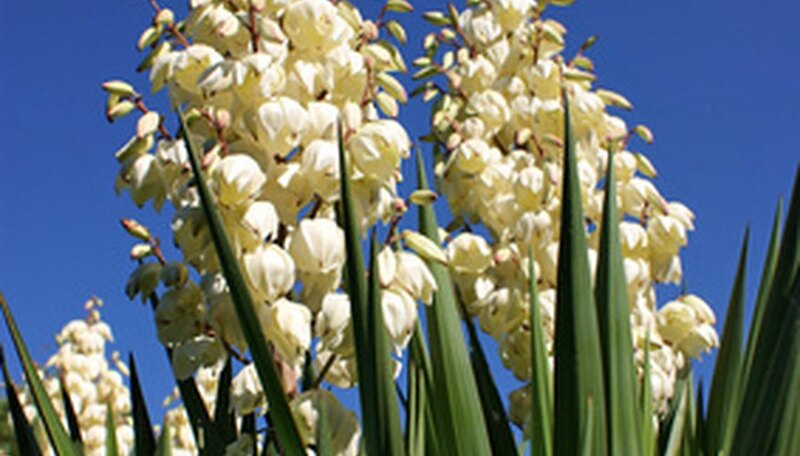 Between summer and fall, the lovely, bell-shaped izote ivory flowers form in upright panicles. The fruit of the tree is a traditional ingredient for cooking in El Salvador. This drought tolerant plant prefers well-drained, sandy soil and sunny growing conditions. The previous botanical name of Yucca guatemalensis was Yucca elephantipes. It is a member of the Agavaceae family. Famous for its spectacular flowers, the maquilishuat (Tabebuia rosea) is the national tree of El Salvador. Its common names are pink poui, pink tecoma and rosy trumpet tree, and it is macuelizo in Spanish. The pink poui is also native to other countries in the Americas, including Colombia, Costa Rica, Mexico, Nicaragua and Venezuela. Its prominent, funnel-shaped, purplish-pink or white blooms flower during the spring. This medium-sized, evergreen tree also has dark green, leathery leaves. It can reach heights of about 70 feet or taller. The tree’s thin wood produces timber for furniture such as cabinets. The tree also has medicinal properties, according to the Turismo El Salvador website. The pink poui prefers full sun and moist soil, and is ideal for coastal gardens and as a shade tree. It is a member of the Bignoniaceae family. Lycaste lasioglossa is one among many common species of terrestrial orchids that are native to El Salvador, as well as Guatemala and Honduras. Lycaste lasioglossa blooms in the spring. The 3 1/2-inch flowers have yellow petals and bronze-copper sepals. They appear on spikes above the leaves and last for about five weeks. These pretty flowers prefer cool conditions and regular water during the blooming period, but require dry conditions in the winter. Given its required conditions, Lycaste lasioglossa grows as easily indoors as outdoors, reaching heights of about 20 inches. Loroco (Fernaldia pandurata) is an edible herb known locally as “quilite” that flowers between May and October. This perennial produces flowers used for cooking in El Salvador and other Central American countries. Propagation is by both seed and cuttings. This flower does best in tropical conditions with temperatures between 68 and 90 degrees F.